most indispensable of all, to produce thoroughly good pictures and statues. Their intention was to reform art by rejection of the mechanistic approach to painting which had come to dominate from Raphael onwards, and was epitomised by the work and influence of Sir Joshua Reynolds. They preferred the intense colours, detail, and complex compositions of Italian ‘quattrocento’ art (of the 1400s). The movement went into decline after 1860, but individuals kept its ideals and style alive well into the twentieth century. 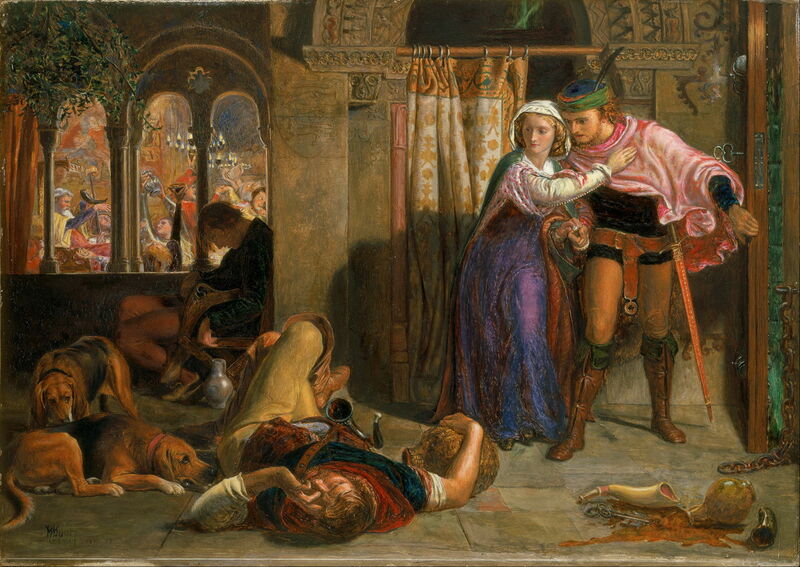 The text narrative for this painting is John Keats’ poem The Eve of St. Agnes (1819). Madeline has fallen in love with Porphyro, who is an enemy to her family. Older women have told Madeline that she can receive sweet dreams of love on the night of St. Agnes Eve, which precedes the day on which the patron saint of virgins is celebrated (21 January). On that night, Porphyro gains entry to the castle in which Madeline lives, and looks for Angela, who remains a friend to his family despite the feud. Angela reluctantly agrees to take him to Madeline’s room, so that he can gaze at her sleeping there. Angela takes him there, and he hides in a large wardrobe. He watches her prepare for bed, seeing her full beauty in the moonlight. He creeps out to prepare a meal for her, but she wakes, and seeing the same figure which she had just been dreaming, takes him into her bed. She then wakes properly and realises her mistake. They declare their mutual love before escaping from the castle past drunken revelers, and flee into the night. Hunt shows the climax of the poem, with Madeline and Porphyro, dressed in their cloaks, creeping past the drunken bodies of those who have been at the feast. Through the arches at the left the drinking and feasting can be seen, still in progress. In the foreground he shows one of the revelers clutching an empty cask of drink, whilst other remains of the drinking are scattered on the floor to the right. Two large dogs appear to be somnolent, not reacting to events. Madeline’s face has a neutral expression, and she has her right arm across Porphyro’s chest to restrain him, her left hand in contact with his right hand on the hilt of his (smaller) sword, as if to restrain him from drawing that sword. Porphyro’s face shows tension, almost amounting to anger, perhaps, as his left hand holds a door behind him, at the right edge of the painting. That door bears a key, suggesting that it is an outer door. His right hand grips the handle of his sword, as if he is about to draw it. However both figures appear relatively static, and do not appear to be moving at any speed. There are thus ample cues to link into the text narrative, and the painting appears to follow that closely, using facial expression and body language conventionally. Millais shows the climax of this narrative, Ophelia drowning herself in the “weeping brook”. Her facial expression has the vacant stare of imminent death, her hands and dress passively buoyant in the water. He used extensive symbolism in the flowers shown: roses for love, and possibly alluding to her brother calling her the ‘rose of May’; willow, nettle and daisy for forsaken love, suffering, and innocence, respectively; pansies for love in vain; violets (in her necklace chain) for faithfulness, chastity, or young death; poppies for death; forget-me-nots for remembrance. This is probably the most famous painting of all those by Pre-Raphaelites, and Millais painted its background en plein air near Ewell, Surrey, England. 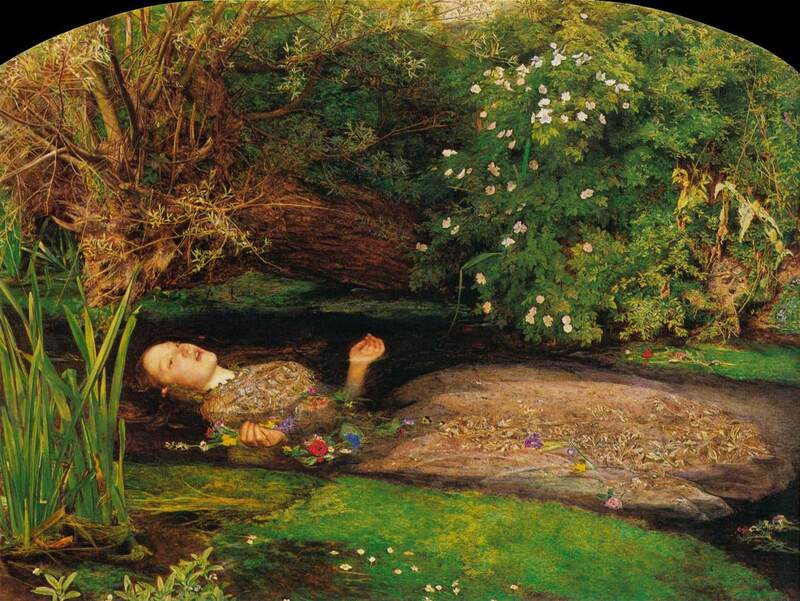 He then painted in the figure of Ophelia, using Elizabeth Siddal (who later married Rossetti) as his model. She posed in a bath full of water, which was warmed from underneath. The story of Cinderella was first published in Italy, but is well-known throughout Europe. A widow with two vain and selfish daughters marries a widower with one good and beautiful daughter. The two vain daughters oppress their good step-sister, who is given all the chores to do and thus becomes known as Cinderella. One day the Prince invites all the young ladies to a ball, so that he can choose a wife from among them. The two vain daughters plan and prepare, intending that Cinderella should not go. After they have left for the ball, Cinderella sits crying, and her Fairy Godmother appears. The latter turns a pumpkin into a golden carriage, mice into horses to draw it, and Cinderella’s rags into a ball gown with glass slippers. Her Fairy Godmother warns Cinderella that these changes are only temporary, and that she has to return by midnight, when her carriage, etc., will return to their original objects. Burne-Jones shows Cinderella reverted to her plain clothes after the ball, but still wearing one (the left) glass slipper. She is seen in a scullery or similar area, with a dull, patched, and grubby working dress and apron. Other than the glass slipper, there is one further cue to the previous ball: a single pale pink rose to the right of her head. She is staring wistfully into the distance, her right hand holding her hair, her left raising the apron. Millais’ version is very different. 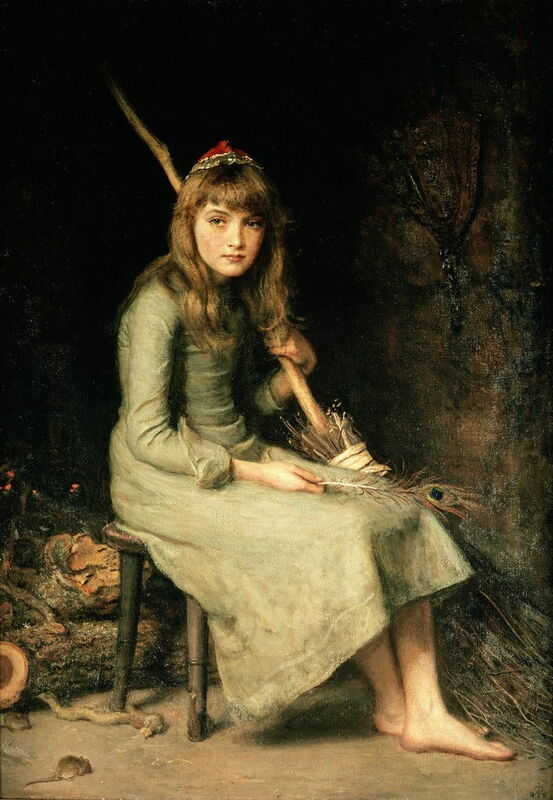 A much younger girl, Cinderella is sat in her working dress, clutching a broomstick with her left hand, and with a peacock feather in her right. She also has a wistful expression, staring into the distance almost – but not quite – in the direction of the viewer. The only other cue to the narrative is a mouse, seen at the bottom left of the painting. Cinderella wears a small red skull-cap which could be an odd part of her ball outfit, but her feet are bare, and there is no sign of any glass slipper. It is thus impossible to decide which part of the narrative he is showing us, and it would be easy to assume that this was simply a portrait of a kitchen waif, not part of the Cinderella narrative. In Arthurian legend, Merlin was a (good) wizard of great significance. This narrative excerpt refers to an event in which the Lady of the Lake, Nimue (or Nimiane, or Vivian), has trapped Merlin helpless in a hawthorn bush while he is under Nimue’s spell. Merlin was infatuated with Nimue, who took advantage of that to learn his magic skills. This story has several variants: the more popular version given by Malory has Merlin trapped under a stone, but Burne-Jones used a late mediaeval French version, which has Nimue with snakes entwined in her hair. 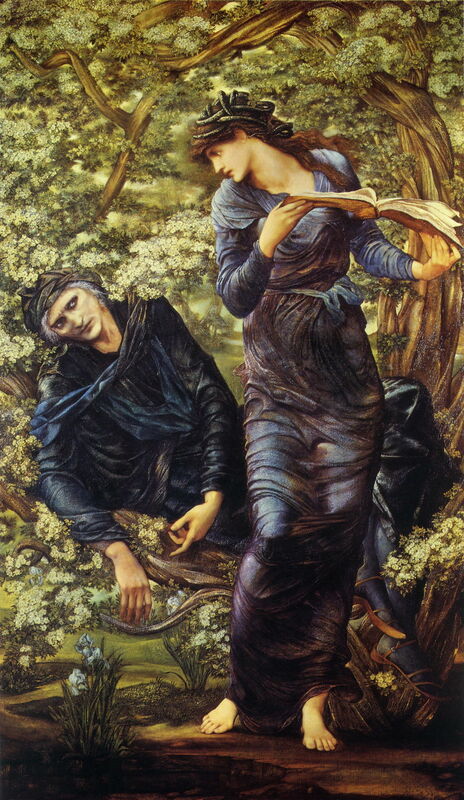 Burne-Jones is faithful to the old French version, showing Merlin, his face full of stupor, trapped limp in a hawthorn, which is in full blossom. Nimue is looking down at Merlin with a powerful stare, holding a book of spells high in front of her. Her hair has black snakes in it, just like the classical monster Medusa. 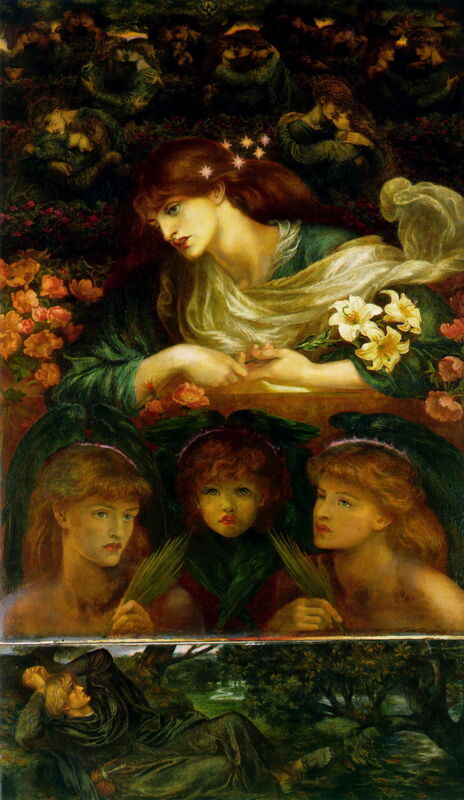 Rossetti was both painter and poet, and in this unusual joint role, wrote the poem on which his painting was later based. Other artists, including JMW Turner, have written verse to accompany their paintings, but Rossetti’s poem is possibly even more famous than his painting. Dante Gabriel Rossetti (1828–1882), The Blessed Damozel (1875-1878), oil on oak panel, 174 x 94 cm, Fogg Museum, Cambridge, MA. Wikimedia Commons. Rossetti has painted a very unusual work for his poem, in which the main part is divided into two sections, and there is a third in the predella at its foot. In the top section he shows the damsel of the title, looking full of yearning, and staring into the distance. Above her are a series of ‘thought bubbles’ (as they have become in graphic novels, etc.) containing scenes with her lover, and at the very top is a dove, representing the Holy Ghost. As in the poem, she has stars in her hair, but only six are shown, not seven, the absent star perhaps representing Merope, the lost Pleiad who was cast out of heaven. She holds three lilies (purity) in her hands, and pink but not white roses (passion) are seen too. Her hair is chestnut brown, not “yellow like ripe corn”. Below her in the main painting are three angelic female heads, and at its foot, in the predella, her lover is seen recumbent in his yearning and thought, looking upwards among rich green wooded countryside. Overall this may have been modelled after classical Venetian paintings depicting the Virgin Mary, an eroticisation of a conventional religious composition. This is one of the narratives contained in Chaucer’s Canterbury Tales, told by pilgrims from London to Canterbury. It is set in a Christian city in Asia, in which there is a community of Jews. The young son of a widow is brought up to revere the Virgin Mary, singing a popular mediaeval hymn Alma Redemptoris Mater (Nurturing Mother of the Redeemer) as he walks to school through the Jewish quarter. Satan incites the Jews to murder the boy, which they do, throwing his body on the midden. His mother finds him there, and his body miraculously starts to sing the hymn again, despite his throat being cut. Christians call for the provost, who has the Jews responsible drawn by wild horses and then hanged. The boy’s body continues to sing throughout his funeral, until the abbot asks how he is able to sing. The boy replies that although his throat was cut, he had a vision in which the Virgin Mary laid a grain on his tongue, telling him that he would keep singing until the grain is removed. The abbot then removes the grain, allowing the boy to die properly at last. 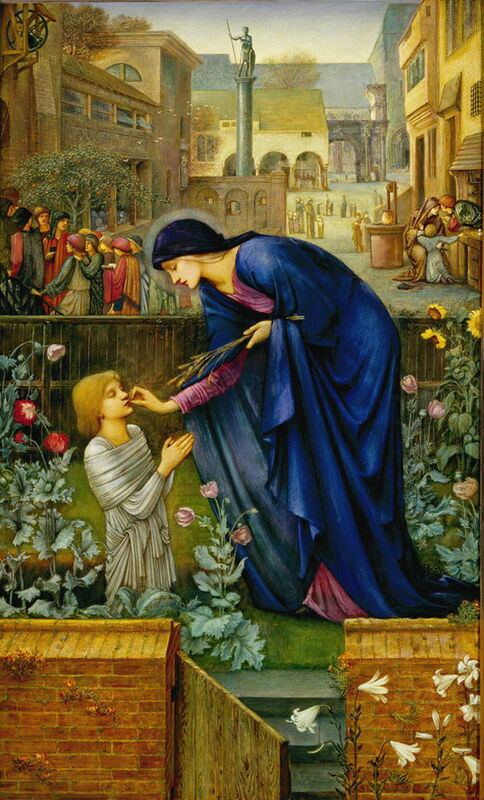 Burne-Jones shows the Virgin Mary placing the grain (taken from the flowering heads in her left hand) under the boy’s tongue, with her right hand. She is identified by her classical ultramarine blue cloak and halo, the boy not on the midden-heap, but stood in mortuary cloths in his grave. Around them are symbolic flowers. Behind are troubled scenes in the city, although it is not clear exactly which part of the narrative they represent – probably the Christians’ response to the disappearance of the boy. 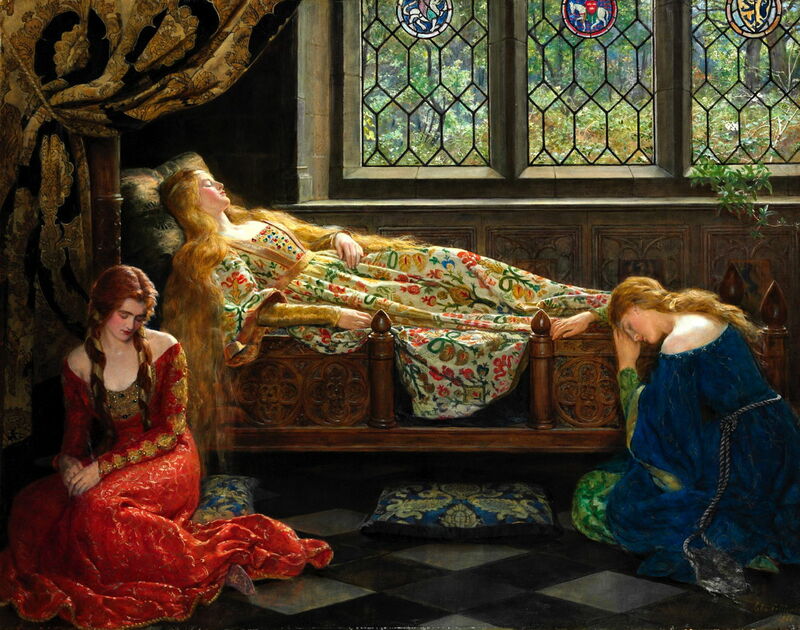 The Sleeping Beauty is another ‘fairy’ story widespread through most of Europe, best known from the version of the brothers Grimm, and retold by Tennyson in his early poem The Day-Dream. The central story tells of a princess, who has seven good fairies as her godmothers. An eighth and evil fairy was overlooked, and seeks a way to get revenge. She puts a curse on the princess that she will prick her hand on the spindle of a spinning wheel and die. One good fairy tries to reverse this, changing the spell so that it will put her into a deep sleep for a century, and can only be awakened by a kiss from a prince. Royal edict then forbids all spinning throughout the kingdom, but when the princess is a young woman, she discovers an old woman spinning, and pricks her finger on the spindle. She then falls to sleep. The king summons the good fairy to try to address the problem. Her solution is to put everyone in the castle to sleep, and to summon a forest with brambles and thorns around the castle, to prevent anyone from entering. A prince later hears the story of the Sleeping Beauty, and rises to the challenge to penetrate the trees and bramble thickets around the castle. He discovers the sleeping princess, kisses her, and she and the rest of the castle wake up. The prince and princess marry, and they all live happily ever after. A pupil of the Pre-Raphaelites working long after most of the them had died, Collier chooses part of the story before the climax. Here the princess and her two companions are shown asleep, with the dense woodland and brambles seen through the window. Pre-Raphaelite artists, including those of the PRB itself and those associated with the movement, used conventional narrative techniques in their paintings, including facial expression, body language, and additional cues to the text narrative. These generally worked well. What is most remarkable, both in these examples and in their body of work, is their reluctance to show scenes involving action of any kind. Almost without exception, they have painted static tableaux rather then snapshots of active narrative. Indeed, when looking for these examples, I had a wide choice of portraits of various figures taken from narratives, but hardly any showing any form of action. Posted in General, Painting and tagged Burne-Jones, Collier, Hunt, Millais, narrative, painting, PRB, Pre-Raphaelite, Rossetti. Bookmark the permalink.